Elmer Ernest Southard's papers primarily consist of handwritten and typed letters he sent to Norman Fenton. Southard, the first Director of Boston Psychopathic Hospital, was Karl Menninger's first significant mentor. Southard and Fenton collaborated on researching case studies and publishing about shell shock in World War I. There is also a course syllabus for his second year neuropathology course at Harvard Medical School. 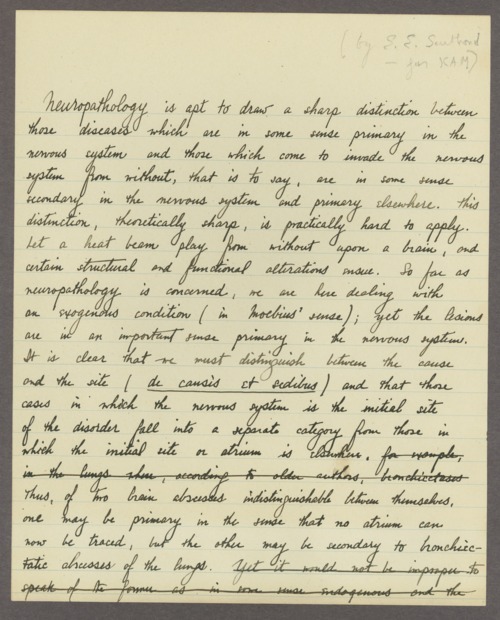 These papers are part of the historic psychiatry material in the Menninger Archives.